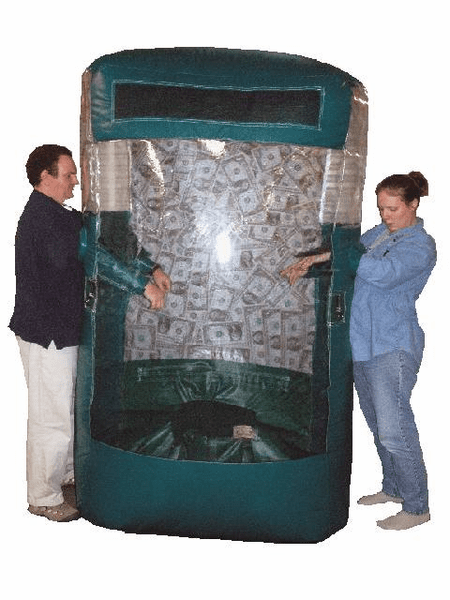 10' tall inflatable money machine. This Cash Cube draws a crowd almost immediately. Turn it on and in seconds it inflates and money, coupons, or balloons start flying around inside as customers attempt to grab what they can. Very portable. We manufacture Inflatable Cash Cubes, also called inflatable money machines. They are great for carnivals or any special event. Perfect for grand openings and special sales. Set it up outside of your location and people will be lining up to have a try at the money machine. And when people see other people lined up outside of your location, they are sure be interested.